A quick overview of buffer vessel sizing. A buffer vessel is a vessel that holds water, increasing the overall volume content of the heating distribution system. The additional water volume absorbs heat (thermal storage) produced by the heating appliance in low load conditions, which the building or system does not yet require principally to prevent plant short cycling. A buffer vessel or thermal store, captures heat to provide a buffer between load variations in order that biomass boiler appliance efficiency can be optimised, thus alleviating slow response issues. A buffer effectively prevents cycling of the boiler when the system demand is less than the boiler minimum output. 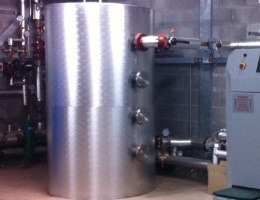 Reducing boiler cycling is important to minimise harmful emissions of CO and NOx. Where the required system volume is that necessary to accommodate the thermal output of the plant and the actual system volume is the water volume in all pipework and heat emitters. where 10L·kW-1 is a typical lower limit for biomass. See our buffer vessel guide download for a full explanation - link below. for a single compressor unit. Different heat generating plant have different requirements. Here are a few basic tips. ASHP: BS EN 15450:2007 suggest sizing the buffer storage volume at 12 to 35 L per kW maximum heat pump capacity. Biomass: Size between 10 and 20 litres/kWth plant capacity (CTG012); a lower value may be used where loads do not not fall to zero, for pellet fuelled boilers which are more responsive and for boilers with a low turndown capability. Where low grade wood with a high moisture content is used, the storage volume may need to be sized at up to 40 litres/kWth. Chilled Water:A rule of thumb is around 2.5 to 8 litres per kW or 8 to 14 litres per kW when temperature accuracy is critical. Buffer vessel A vessel that captures residual heat on boiler shut-down preventing frequent boiler start-ups to improve system efficiency. It will also reduce the energy required from an auxiliary boiler. Usually has a simple on/off control strategy. Thermal Store A vessel that is charged by the biomass boiler when the boiler output exceeds the load demand enabling a small biomass boiler to meet demand. A progressive control strategy using several temperature sensors will control the boiler output.